Snack Girl wants to share about serving sizes of ice cream. Ummm, what happened? At the ice cream stand, I order a Kiddie cone and I can't finish it - and the scoops are as big as my child's head! Okay, enough kvetching. You are going to save money if you avoid the ice cream stand and buy your own ice cream. I suggest buying pints of the good stuff (not half gallons) so you are not tempted to visit the freezer at 1 AM. Then, get some cute shot glasses (photo above) or Japanese tea cups to replace a LARGE bowl that is going to make this serving size of ice cream seem small. We have some beautiful little cups and they are PERFECT for feeling spoiled and for serving small amounts of rich foods. 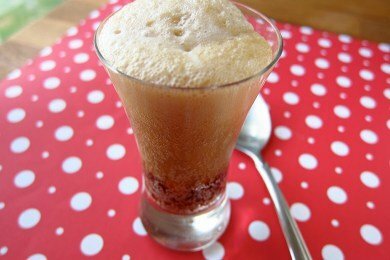 Finally, make a mini root beer float and be amazed at how a small dessert can satisfy your sweet tooth. I bought just one 12 ounce bottle of root beer at the store and served 4 people floats with (get this) one tablespoon each of vanilla ice cream. I either look super cheap or super brilliant (probably super cheap). The ice cream foams when it hits the soda and provides this creamy, bubbly, and sweet yumminess. For your Weight Watchers fans, this dessert is only ONE point. How great is that? How do you keep your serving sizes under control? Pour 3 ounces of cold root beer into 4 small cups. Add one tablespoon of vanilla ice cream and serve immediately! Watch the smiles happen. What a great idea to satisfy your craving without sabotaging your waist line......Thanks!!! Try lime sherbert and seven-up or sprite. Or cherry sherbert with cherry pop....orange sherbert with orange pop.....you get the idea. For some reason I always thought sherbert was much more refresing than ice cream. Great treat to beat the heat! I buy Stonyfield frozen yogurt, especially the Vanilla Fudge Swirl. One serving is 1/4 cup. I thought that I'd sit and eat the whole pint, but I'm actually able to stick to one serving. I eat it slow, and it's so good and decadent that I can enjoy what I have, without wanting more. Every now and then, we'll get an ice cream craving, so we'll pick up a couple of those single serving Ben and Jerry's, Edie's, or Haagen Dazs containers. Sure, they're a buck a piece, but they control our portion size nicely, and we don't have the temptation of a larger quantity in the freezer. Small floats looks good...I love eating 'the real deal' just in smaller portions. This is so great! I can't wait to try if. Any idea's where to get the cute shot glases? I would like some plastic ones(not disposable ones) for an upcomming barbeque. Also...I love making my own frozen yogurt so I might splurge and make it ice cream for these. "I read about Arctic Zone ice cream earlier this week and it has only 150 calories for an entire pint. Probably not healthy"
Actually it IS healthy (no artificial sweeteners and lots of protein)... but it TASTES like it has that few calories... it's fine with other things but by itself is 1) not very sweet 2) you can tell it lacks fat 3) has a rather dense nonfluffy non icecreamlike texture. This looks so adorable, but I'd be afraid I would still be too hungry! Oddly enough, I have issues with full fat dairy products, so light ice creams are the only kinds I can eat. I love to use the smaller serving dishes though, i eat my ice cream out of a glass ramekin. Honey, in this economy there is nothing wrong with being thrifty (cheap). It's entirely underrated!! They are the PERFECT size. Good job! never worry about how big a scoop ever again. I'm going on two years of a 30 pound weight loss and this has helped so much.